In Jesus mighty name, every stronghold in my life will be destroyed when I call upon You, Oh Father. According to You oh Lord, victory over strongholds is mine today and I will rejoice in it. I will overcome any, and everything, that tries to hinder me from the path which You have set before me, just as You overcame the grave! Colossians 1:13 The Father has delivered and drawn us to Himself out of the control and the dominion of darkness and has transferred us into the kingdom of the Son of His love. Psalm 56:13 For You have delivered my life from death, yes, and my feet from falling, that I may walk before God in the light of life and of the living. 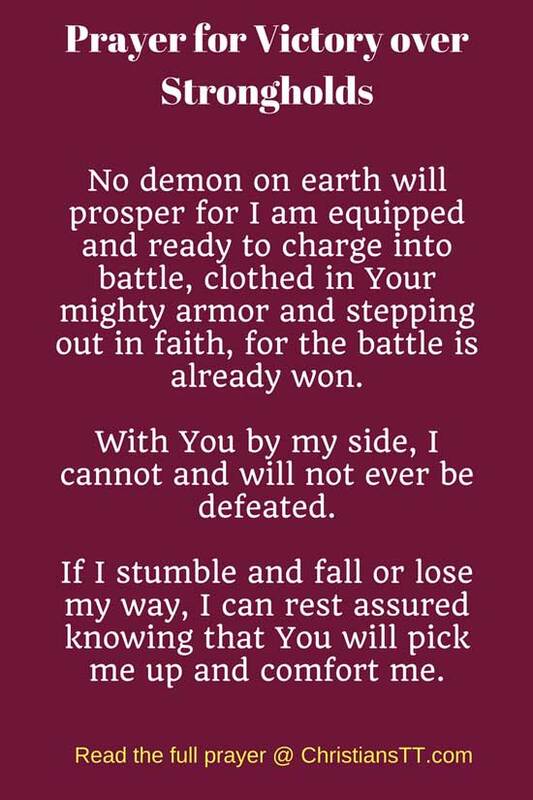 No demon on earth will prosper for I am equipped and ready to charge into battle, clothed in Your mighty armor and stepping out in faith, for the battle is already won. You are always by my side, therefore I cannot, and will not, ever be defeated. Yet, if I do stumble and fall or lose my way, I can rest assured knowing that You will pick me up and comfort me. 2 Samuel 22:2 And he said: “The LORD is my rock and my fortress and my deliverer. Set my path straight, Oh Lord. Draw near to me, closer and closer each day. Let no evil befall me. In temptation I will not yield, for my strength in You will conquer defeat as I dance in my victory. Break every chain that attempts to bind me. Remove distractions from my path so that the plans You have laid before me will surely come to pass, for it is my destiny to be victorious, in Christ Jesus. Amen! 2 Timothy 4:18 And indeed the Lord will certainly deliver and draw me to Himself from every assault of evil. He will preserve and bring me safe unto His heavenly kingdom. To Him be the glory forever and ever. Amen. Psalm 68:20 God is to us a God of deliverances and salvation; and to God the Lord belongs escape from death [setting us free].